Like you, I’m trying to learn how to eat healthier. I wanted a long list of healthy snack ideas to choose from when preparing my shopping list, so I decided to create one. Now I’m sharing it with you in the hopes that you”ll find it beneficial too! 1/2 cantelope, scrape out all of the seeds and put low fat or fat free frozen yogurt in. Delicious on a warm summer day! Fresh avocado on toast – Remove the meat of the avocado from the skin and mash in a bowl (sprinkle on a little lemon juice to retain color), toast your favorite bread and spread avocado on it. Add salt and pepper. Yogurt and fresh fruit parfait – layer vanilla yogurt and your choice of fruit. Some ideas are blueberries, strawberries, bananas, melon, etc. Need an on-the-go snack? Layer your yogurt and fruit parfait in a waffle cone! Banana split made healthy by topping your banana with yogurt flavors – strawberry, vanilla, chocolate, blueberry, etc. Then sprinkle a little low-fat granola on top. Wrap a piece of uncured (no nitrates or nitrites) ham or turkey around string cheese. Dip apple slices into one tablespoon of natural peanut butter. Dip a large pretzel stick into one tablespoon of natural peanut butter. 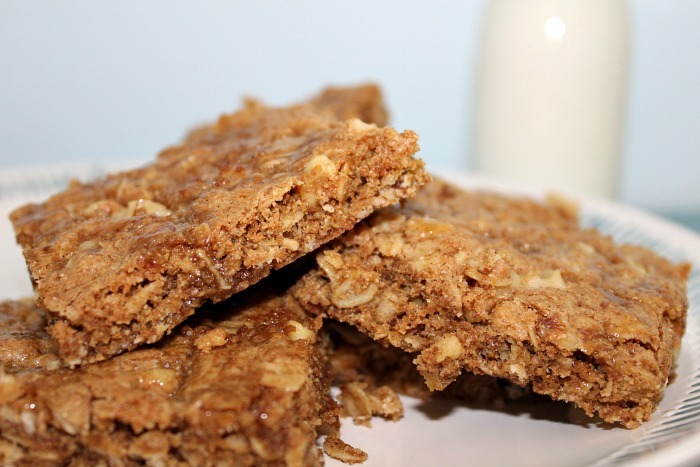 Homemade granola bars – this is a yummy recipe! Protein balls – these are very popular right now. They require no baking so it’s easy to whip up a bunch and pop them in the fridge for quick and easy munching. A basic recipe is: 1 1/2 tbsp peanut or other type of nut butter, 3 tbsp oatmeal, 1/2 tbsp honey and 1/2 tbsp dark chocolate mini chips, rolled into balls. There are lots of varieties to this basic recipe, eight can be found at Bless this Mess! Dried fruit, such as apples, apricots, cherries, cranberries, etc. Rice cake spread with a little peanut butter or yogurt or both! Now top with fresh fruit. Frozen yogurt fruit cups – spoon your favorite yogurt into an ice cube tray, candy mold or silicon muffin pan and put some small fruit such as blueberries, raspberries or cut up fruit on top, pushing it into the yogurt. Freeze and enjoy! Nachos snack – baked tortilla chips sprinkled with cheese and melted in microwave. Then dip into salsa or guacamole. Mini whole wheat pita stuffed with healthy options, such as hummus, goat cheese, or feta cheese with a little sliced cucumber, shredded carrots, tomato slices, chopped green onion or any other of your favorite chopped veggies! Many foods are healthy as long as we watch our portion sizes. “Everything in Moderation” is a good quote to follow when it comes to eating and actually most things in life. 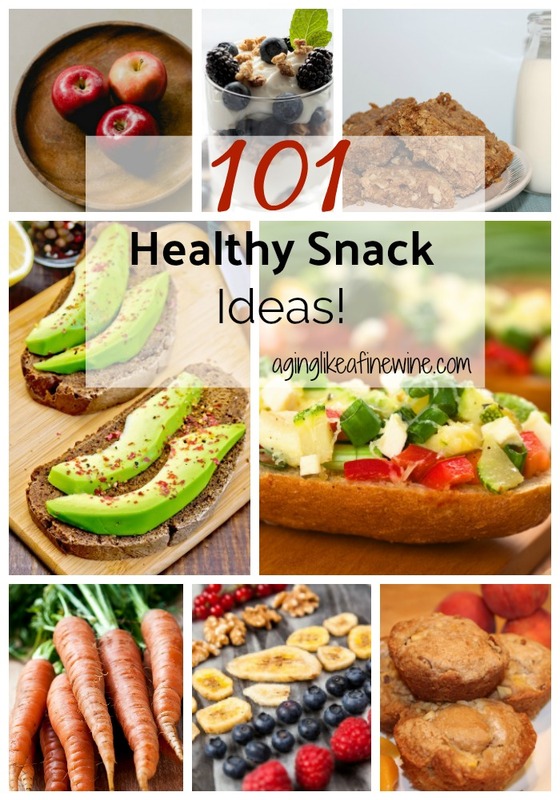 I hope you enjoy this list of healthy snack ideas and find some that are new to you! This post will be shared on some of the lovely link parties found on my “Where I Party” page! You had me when you mentioned the first chocolate chip, Theresa. These sound like yummy snacks! Thank you. They are super yummy! With 101 delicious ideas, I should never run out of ideas for a snack. I’m definitely saving this post. Thanks! Thank you Christie, I hope you enjoy them! WOW, so many choices and lots of good ones too! Thank you Teresa for attending the #WednesdayAIMLinkParty. I pinned your post on Pinterest and shared it on Facebook and Twitter. Thank you so much Dee! I’m so excited about being featured! Thank you for hosting and giving us the opportunity to link up.